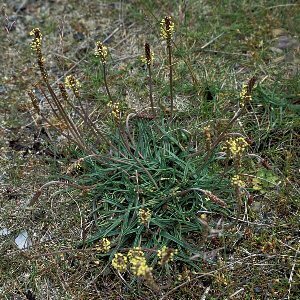 A common species of sea cliffs and rocky sea shores, often growing with Plantago coronopus. 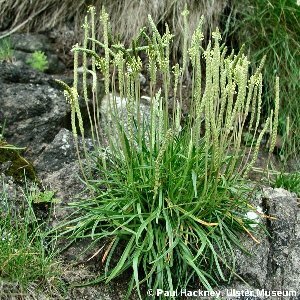 The leaf is the narrowest of any Irish Plantago species. Like all native Irish plantains, the flowers are wind-pollinated and produced in tight spikes on the ends of long scapes. The spike of P. maritima is rather long and narrow. 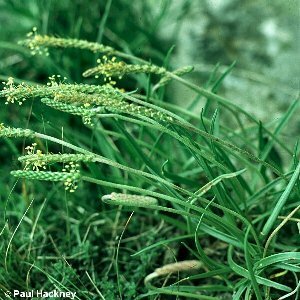 The plant is at its most attractive at the stage when the pollen is produced, when the yellow anthers hang out from the flowers on the ends of their long filaments, but otherwise the flower and fruit spike is drab and uninteresting-looking.